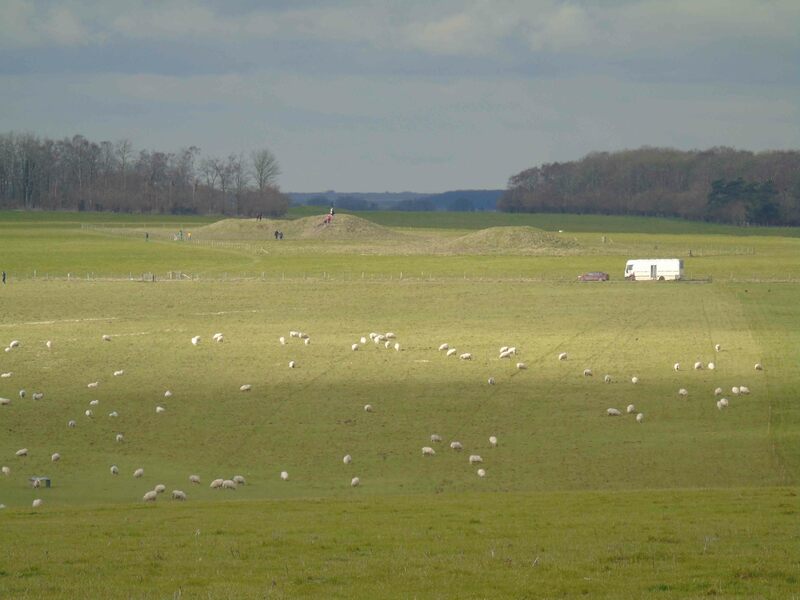 The Cursus barrow group are a striking linear arrangement of Early Bronze Age burial mounds prominently situated on the north-western skyline when viewed from Stonehenge. They run for c. 1200m along the roughly W-E ridge located south of the west end of the Stonehenge Great Cursus (dated c. 3600-3300 BC). The barrows are largely bowl and bell barrows, the Fargo hengiform enclosure and the large bell barrow ‘The Monarch of the Plain’ (Amesbury 55). The prominent western end of the Great Cursus defines the north-western edge of this barrow cemetery. William Stukeley excavated two barrows here in 1723 and Richard Colt Hoare examined them in the early 19th century. The mounds have been recently re-surveyed by English Heritage. When excavated, they were found to contain a range of Early Bronze Age burials including individuals accompanied by Beaker and Collard Urn vessels (c. 2500-1600 BC). From a visitor perspective, I reflected on how only this small section of the broader nested ridge-lines of complex multi-phased barrow cemeteries encircling Stonehenge is directly accessible to visitors walking between Stonehenge and the Stonehenge Visitor Centre. Helpful signboards help visitors navigate this complex landscape. Most of my recent work has focused on conceptualising museum displays of the human dead. Yet of course the single crouched burial within the Stonehenge Visitor Centre speaks for these complex three-dimensional necropoli in the Wiltshire landscape comprising of barrows of different size, shape and form that populated the landscape when Stonehenge was already an ancient monument.